Debug the BLINKY example program following this procedure. The debugged program is ready for the serial output check. Use the Start/Stop Debug Session toolbar button or the µVision command Debug - Start/Stop Debug Session to connect the debugger to the Keil ULINK Adapter. The CPU stops and connects to the OCDS (On-Chip Debug System) of the Infineon XC800 device. For details on the debugging features, refer to the µVision User's Guide. Debugging the BLINKY program using the µVision debugger requires the ULINK USB-JTAG adapter. 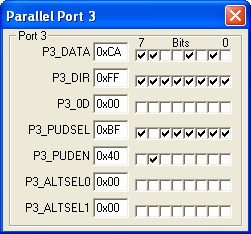 The Parallel Port 3 dialog reflects the status of the I/O ports. 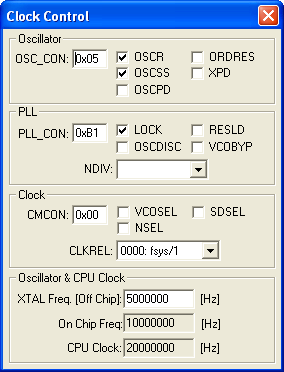 The Clock Control dialog shows the core clock configuration of the XC800 device.